The new Platinum Series Suction Regulators are the next generation in suction control products. The Platinum Series features new options and enhancements that deliver higher performance than any other suction regulator currently available. NFPA99 requires that hospital suction inlets provide a minimum of 89lpm of free air flow. The proprietary design of the Model 3840 ensures you will have all of this flow available for needed field clearance. Unlike competitive suction regulators the 3840 does not restrict the available flow from the central station inlets. The new 3800 Series Suction Regulators are supported by a 12-Year Warranty. These regulators feature technological advances that protect the interior regulating mechanism from flooding and contamination- the most common cause for regulator failure. This innovation gives the regulator extended life, which allows us to guarantee trouble free operation for the length of its 12-Year Warranty. 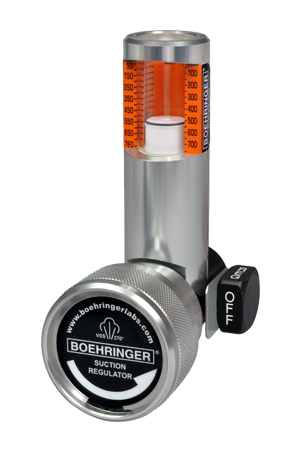 I know I can be assured that Boehringer's Suction Regulators are tough and will last. High Flow suction is appropriate for use in the surgical field and any other application that requires suction levels about 200 mmHg, such as emergency airway clearance.